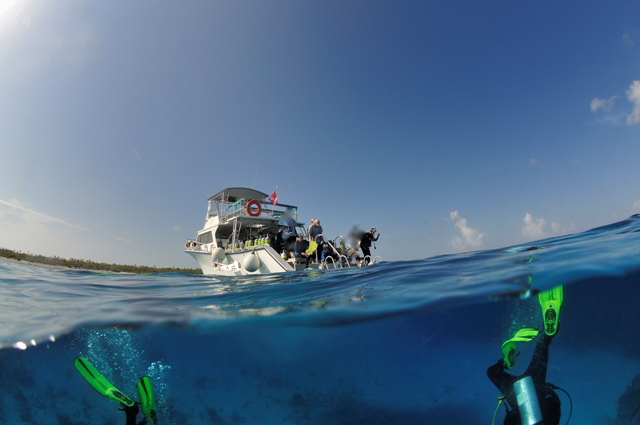 In a move that has angered many Blacktip Island scuba diving guests, Eagle Ray Divers is using an experimental tractor beam to lift scuba divers wearing too much lead weight back onto the resort’s dive boats. Divers claim the device’s use is aimed at weighty divers, not the divers’ weights. Eagle Ray Divers operations manager Ger Latner denied the claims. “We tried asking guests to take their weight pockets out,” said Eagle Ray Divers divemaster Gage Hoase. “A few do, but most refuse. One over-weighted BC at the wrong time can end a divemaster’s career. Eagle Ray Cove resort management enlisted the aid of local scientists after a rash of dive staff injuries. “Our attraction beam prototype was at the trial stage,” said Tiperon University-Blacktip magneto-gravitic engineering professor Stina Ray. “Hauling in divers provides the perfect beta test. And if it keeps people from getting hurt, that’s an added bonus. Eagle Ray Cove’s dive guests remain outraged. Eagle Ray Divers’ Latner was unapologetic.